The daffodils are in full bloom and spring must surely have arrived. But the cherry blossoms on the tree at the front of the house are still very small, and many of the trees in the area are still bare, with a wintery look about them. But the clocks move forward on Sunday, and the extra hour in the evening will make it easier to go for walks later in the day. This was the first evening this year that I had an opportunity to walk most of the way home in daylight after work, and for over an hour I walked along the banks of the River Dodder, from the footbridge below the Loftus Triumphal Arch leading across the river into the grounds of the High School as far as Templeogue Bridge. At the small footbridge at the High School, a lone swan was squat on the opposite bank of the river, preening herself. As I continue on, a heron flew down from the trees and stood on the footpath, peering into the water, poised to harpoon any fish he could spy. As I moved closer, he stood on the edge of the path, content to let me pass behind him, confident I was no threat, and as I continued he seemed to follow my footsteps, fearless and in search of a better vantage point. Little could he have known that further upstream, above the weir near Rathfarnham Bridge, a handful of Polish-speakers with fishing rods were equally attentive and ready to spoil his prospects. Even at the weir, bright yellow daffodils are pushing through the weeds and rough patches of waste land. I crossed Rathfarnham Road at the bridge, and continued on upstream until I was just below Rathfarnham Village. There a half dozen or so cement blocks allowed me to step across the river, and to join the path on the north bank, between the trees on the river’s edge and the high wall that encloses Bushy Park. I stepped into the park briefly to admire the weeping willows that dip into the small artificial lake before continuing along the path. Bushy Park covers over 20.5 ha and covers a large area between the suburbs of Terenure, Templeogue and Rathfarnham. This was once the grounds of Bushy Park House, first built in 1700 by Arthur Bushe of Dangan, Co Kilkenny, Secretary to the Revenue Commissioners. John Hobson became the owner in 1772 and changed the name of the house to Bushy Park, possibly after Bushy Park in London. The third owner, Abraham Wilkinson, added almost 40 extra hectares to the estate in 1791. Five years later, he gave the house as a dowry to his only daughter Maria in 1796 when she married Sir Robert Shaw, who was MP and Lord Mayor of Dublin. Shaw had lived nearby at Terenure House, which later formed the nucleus of what is now Terenure College. George Bernard Shaw was related to the Shaws of Bushy Park – his grandfather was a nephew of Sir Robert Shaw. The Shaw family sold the house and grounds at Bushy Park to Dublin City Council in 1953. The house and 8 ha of grounds were then sold in 1955 to a teaching order of nuns, who then set up Our Lady’s School for Girls. 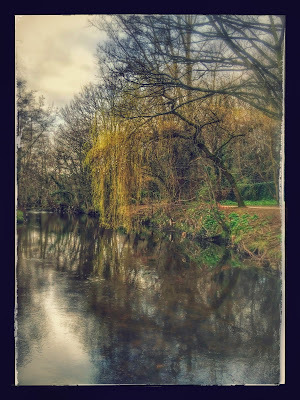 I continued along the river bank, behind Templeogue, with Rathfarnham Shopping Centre on the opposite bank; everywhere daffodils were pushing through the grass, along the river bank, in the open spaces, against the rear walls of the houses that face onto Templeogue Road. In places, the bank is steep and almost as high as I am. As I pushed on, I unwittingly disturbed a second heron, who was below me on the shingles in the river bed, and soared up above the shopping centre before flying on in the direction of Bushy Park. Eventually, I found myself at Riverside Cottages, a crescent of cottages built in 1909 and hidden behind Templeogue Tennis Club, looking almost like a rural oasis hidden from suburban life and the pleasures of the tennis club. But the plans for a linear park along the banks of the Dodder are still a dream waiting for completion, and eventually to continue along my way I had to walk through Templeogue Village and on to the bridge at Firhouse. The change in the clock on Sunday morning brings longer evenings and the hope of more walks by the banks of the river in Rathfarnham, Templeogue, Knocklyon and Firhouse. I was listening yesterday [26 March 2015] to his arrangement of Psalm 100, ‘The Old Hundredth.’ This morning [27 March 2015], I invite you to join me in listening to Vaughan Williams’s arrangement for ‘Disposer Supreme’ or the ‘Old 104th’ and the hymn ‘Disposer Supreme’ (New English Hymnal, No 216). The harmonisation for this hymn is Vaughan Williams’s adaptation of ‘Old 104th,’ originally composed for Psalm 104 by Thomas Ravenscroft (1592-1635). The words of the present hymn were written in 1686 by Jean-Baptiste de Santeüil (1630-1697) and were translated into English in 1836 by Isaac Williams (1802-1865). Vaughan Williams probably came to know and love this because of the strong Goucestershire connections of Isaac Williams. Indeed, he was so fond of this tune that he wrote a remarkable Fantasia for piano solo, chorus and orchestra on it. Jean-Baptiste de Santeüil was born in Paris on 12 May 1630. He was a member of the Canons Regular of St Victor in Paris. Under the name of Santolius Victorinus he was a distinguished writer of Latin poetry. Many of his hymns appeared in the Cluniac Breviary (1686) and the Paris Breviaries (1680 and 1736), and his Hymni Sacri et Novi were published in Paris in 1689, with a posthumous enlarged edition in 1698. This is one among several of his hymns that have been translated into English. He died in Dijon on 5 August 1697. The Revd Isaac Williams, who translated this hymn, was born in Cwmcynfelin, Cardiganshire, on 12 December 1802, and was brought up in his parents’ house in Bloomsbury, London, where his father was a Chancery barrister at Lincoln’s Inn. He gained several school prizes at Harrow, and as a student at Trinity College Oxford, he gained the University Prize for Latin Verse. This prize brought him into close relationship with John Keble, who became his spiritual father, and with Hurrell Froude. In his second term he was elected a scholar of Trinity. He graduated BA (1826), MA (1831), and BD (1839), and was ordained deacon in 1829 and priest in 1831. He was a curate in Windrush (1829), a Gloucestershire village about 12 miles from John Keble’s home at Fairford. But he returned to Oxford that year as a tutor at Trinity College. In 1832, Williams became John Henry Newman’s curate at the University Church of Saint Mary the Virgin, Oxford. There in 1833 John Keble preached his Assize Sermon, which became the spark that ignited the Oxford Movement. While he was Newman’s curate at Saint Mary’s from 1832 to 1842, Williams was also a Fellow of Trinity College Oxford at the same time. While there he published his first poetical collection in 1838, The Cathedral, or the Catholic and Apostolic Church in England. It was modelled on George Herbert’s The Temple (1633), but the idea was worked out in greater detail, connecting each part of the edifice with some portion of church doctrine or discipline. Williams became the most prolific of the Tractarian poets, writing no less than 11 volumes of poetry for the movement. When Keble resigned as Professor of Poetry at Oxford in 1841, his friend appeared to be the obvious choice to succeed him. But Williams was closely identified with the Tractarians. He was a close friend of Keble and Newman, and was in 1838 he was the author of Tract 80, on Reserve in the Communication of Religious Knowledge, which, next to Tract 90, had stirred the greatest controversy. The election became a referendum on Tractarianism and the beliefs and writings of the Oxford Movement, and instead the chair went to Edward Garbett of Brasenose, who was unknown as a poet. Williams resigned his fellowship in 1842 when he married Caroline Champernown of Dartington Hall, Devon. He left Oxford, and went to Bisley as curate to John Keble’s younger brother, the Revd Thomas Keble (1793-1875), who was also a Tractarian. Keble was one of the first priests in the Church of England to revive the daily service in church, both morning and evening — a feature in his parish work that was the subject of a beautiful poem by Williams. However, Williams suffered from bad health for the last 20 years of his life. He resigned as Keble’s curate in 1848 and moved to Stinchcombe, Gloucestershire, where his brother-in-law and fellow Tractarian, the Revd Sir George Prevost (1804-1893), was the vicar. He lived there until his death on SS. Philip and James Day, 1 May 1865. Prevost, who became Archdeacon of Gloucester (1865-1881), later edited the Autobiography of Isaac Williams (London, 1892). And brings unto mortals the hope of new birth. And long blast shattered proud Jericho’s wall. The dull soul awaken, her vigils to keep. Dost call us from darkness thy glory to see.